We had the first Brio-R in the country, being the first made for Australia unit prior to stock shipment. Immediately out of the box it impressed as resembling mostly an ingot of solid steel, a real piece of cast in England. The Ear.Net August 2012 . The obvious changes are the move to a half sized component and the inclusion of a remote. Remote ... now included and it does the CD Player as well ... it wouldn't kill you to get off the couch to change the volume but I must confess it had sometimes been a dealbreaker with the previous model. There is more than that going on though. The amp has more authority and presence fresh out of the box. Really good control and articulation down low and Johnny Cash's baritone tunes come through with depth and power. You should try the Brio-R with the Sonus Faber Toy bookshelves and Johnny Cash's American III-Solitary Man. Wicked combination. Here is their conclusion ... in French ... they think it's brilliant ... it got five stars for everything. "Voici un appareil qui ne va laisser personne indifférent. Le Rega Brio-R est un intégré diablement musical à l’éventail de qualités subjectives extrêmement large et proposé à un tarif qui va provoquer une toux compulsive chez les concurrents. En un mot comme en cent, il n’y a à notre connaissance pas de rivaux sérieux prêts à en découdre dans cette tranche de prix. Mieux,les prestations musicales et techniques du Brio-R, qui offre une entrée phono MM de qualité, vont sans aucun doute piétiner les plates-bandes de machines de plus grande envergure. Un best-seller en puissance." Google translate: "Here is a device that will leave no one indifferent. The Rega Brio integrated-R is a damn musical range of the extremely broad and subjective qualities offered at a price that will cause compulsive coughing among competitors. In a nutshell, to our knowledge there are no serious rivals ready to fight in this price range. 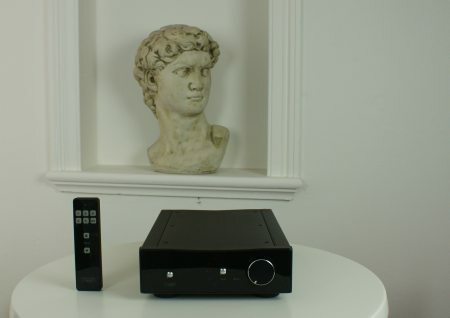 Best, musical performances and technical Brio-R, which offers a MM phono input quality will undoubtedly trample the flower beds of larger machines. A bestseller in power. " And here is the link to the official Brio-R website. Rega Brio-R Integrated Amplifier .